Dainty Jewell's Spring '18 team favorite! Can you just see yourself twirling through sunny green meadows in this dress? We think maybe there's never been a dress so pretty and feminine as this one! The lace is to-die-for, and the white fabric printed with black stripes and dainty pink and yellow flowers is the epitome of loveliness. You will get so many compliments wearing this dress! Flattering in EVERY way! Beautiful for church or any of your season special occasions. Luxurious fabrics, prints, and style. White floral chiffon; 100% polyester. So beautiful & amazing quality! 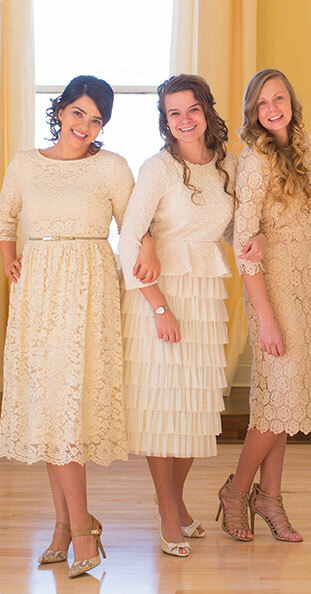 This dress is absolutely stunning and dainty! It fits so well and flows just wonderfully. I feel amazing in it! Love love love! I got this for Easter and i tried on and love it.It is true too size and sooo beautiful.